The Indian 10-rupee coin (Rs. 10) is one of the denominations of the Indian rupee. 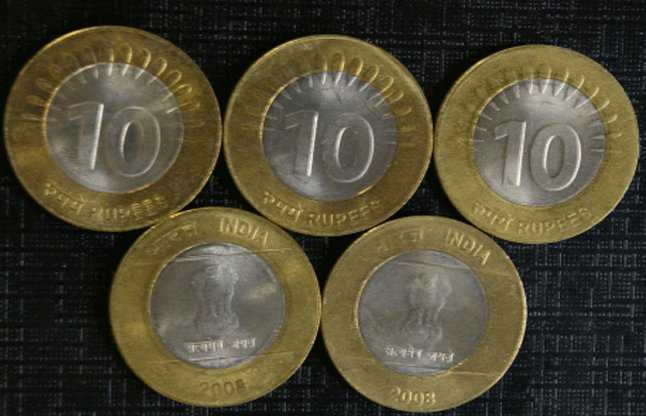 The 10 rupee coin is the highest denominated coin minted in India since 2005. The present 10 rupee coin in circulation is from the 2011 design of the coin. However, the Rs. 10 coins minted before 2011 are also acting as a legal tender in the country. But since few months, there had been a rumour that the fake 10 rupee coins are circulating in the country. According to the reports, the cost of producing a fake currency coin is high when compared to producing a fake currency note. 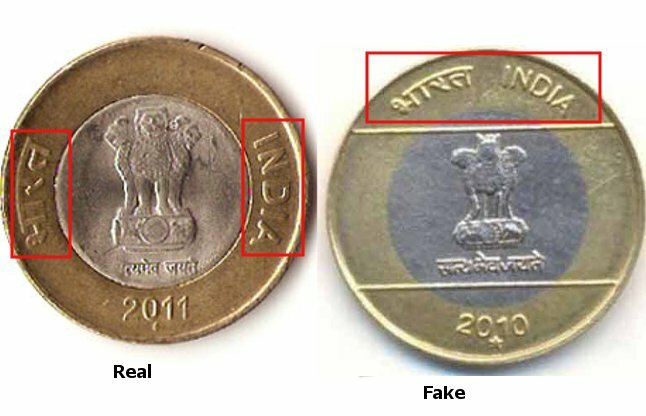 But we don’t know why these fake coins are being circulated in the country. There are few stories and images circulating online. So, we have to wait and see whether the rumour is fake or real. Meanwhile, we shall educate you how to differentiate a fake and a real 10 rupee-coin. 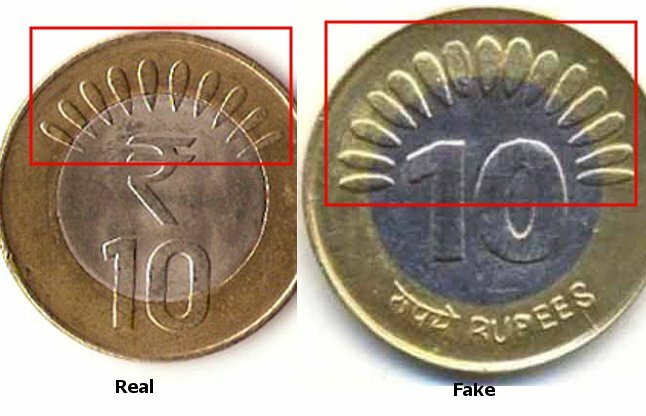 Fake 10 rupee coin consists of 15 strips on it, whereas Original coin has only 10 strips. Check for the place where the Number 10 is printed. In the real coin, the number 10 is printed with both gold and silver covered on it, but on fake coins, the number is printed only on silver. Check for the rupee symbol above the number 10. If there is no symbol, then it is a fake coin. Bharat (in Hindi) and India are the words printed on the gold on both sides of the three lions symbols. On a fake coin, the words are printed on the top of the coin. Check for the horizontal lines above and below of the three lions symbol. If there are those lines, then it is a fake coin. Are you going to buy an iPhone, then this is for you. Check these 10 real and fake iPhone differences before you buy it. If you are a Xiaomi user then this article is for you. Check these differences to find the real and fake Xiaomi Mi power bank. Going to buy Ray-Ban sunglasses, then check these differences to identify the real and fake Ray-Ban sunglasses before you buy it. What To Do When You Are Doubtful About Fake 10 Rupee Coins? Approach the bank with the coins instead of verifying with someone or spreading rumours. Banks will take away and issue a certificate. The currency would be sent to the RBI and if it is judged as a fake, a police investigation could be started. If not, it will be replaced. But remember that there is no such arrangement with the bank to exchange the counterfeit coins or currency notes. As per RBI circular, “all banks are mandated to accept coins of all denominations which are only legal tender from any individual without any restriction and pay the equivalent value in notes.” Based on such rumours, many people started to reject the acceptance of 10 rupee coins. Also, there are rumours that the circulation of 10 rupee coins stopped. However, there is no such truth in this. 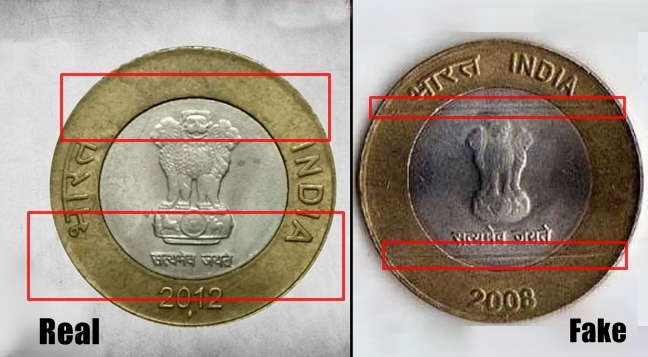 These are the 5 differences where we can find out the real 10 rupee coin and fake 10 rupee coin. 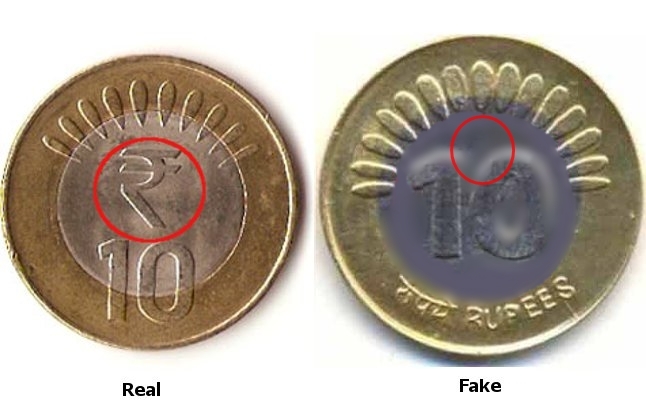 If you have faced any incident of having fake 10 rupee coin, let us know in the below comments. If you wish to find out any other differences in any products or anything, let us know with your valuable comments so that we will do deep research and present an article about that issue. Your article is quite descriptive about the 10Rupee coin.. the ways explained by you are really important to bookmark for the further reference, Your article will really awareness of the people. Hi,I check your new stuff named “How To Identify A Real And A Fake 10 Rupee Coin” like every week.Your writing style is witty, keep up the good work! And you can look our website about love spell.